American students planning on studying abroad and foreign students who have enrolled in a Montana high school or college will often have to provide copies of certain records as a condition of obtaining a visa or having the credits transfer back to their home country. We urge students (and host families) to be aware of all requirements and to allow plenty of time for obtaining the necessary documents, having the documents notarized or certified and then submitted to this office for the apostille or authentication. Carefully read the general information about obtaining apostilles or authentications in Montana, so you will be familiar with the steps needed to obtain the apostille or authentication certificates on your documents. There are two types of school documents that are routinely required to be submitted for apostille or authentication – transcripts and diplomas. These documents are handled somewhat differently due to their classification as “public” vs “private” records in Montana. A transcript is considered a public record and must be certified by a school official and then the official’s signature can be notarized. An original diploma, on the other hand, can be copied and certified by any notary public. Below is the information applicable to each of these types of documents with illustrations of how the certification/notarization must be done. If you have any questions, please contact the Notary & Certifications Division staff at (406) 444-1877 or [email protected] for more information. State certified copies of school transcripts or grade reports are frequently requested for foreign exchange students. These documents must be properly certified by an authorized school official, such as a principal, registrar, superintendent, etc., and then notarized before you can send them to the Secretary of State’s Office for an apostille or authentication. This can be done using the Certification of School Records form. 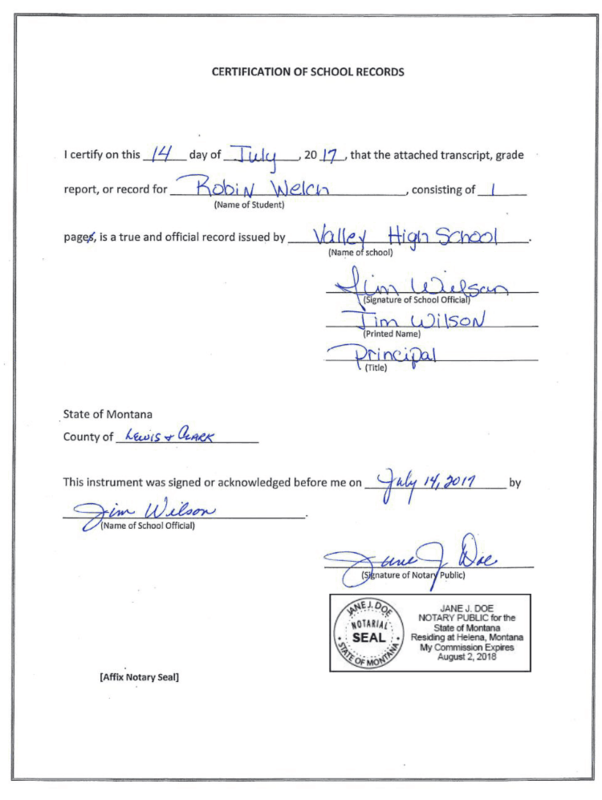 Original diplomas from any school may be copied by any Montana notary who will then complete or attach a copy certification block on the back side of the copy. The notary must make the copy. 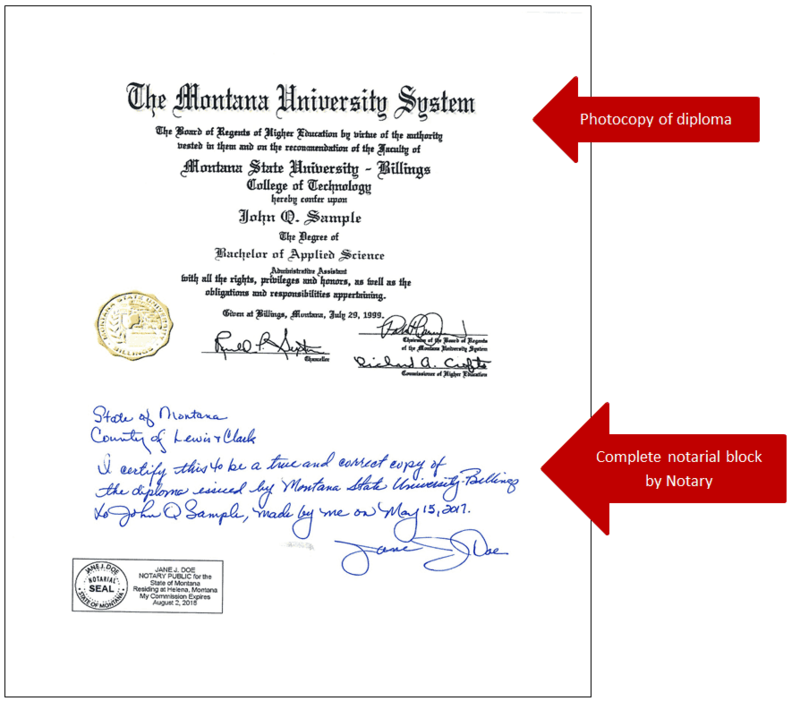 NOTE: Montana notaries may not certify the actual original diploma – by law they can only certify a copy of a document.